SAFERACK PROUDLY INTRODUCES MARINASTEP, SAFE ACCESS RAMPS AND GANGWAYS FOR SHIP AND BARGE ACCESS. Andrews, South Carolina – SafeRack, the world’s largest manufacturer of truck and railcar loading platforms and safety equipment, is excited to announce the latest addition to its premier safe access and fall protection product line. MarinaStep is an innovative line of ship and marine gangways and access ramps, specifically designed for the maritime marketplace. MarinaStep access ramps and gangways are constructed using a U-body frame which requires fewer welds, producing a stronger product. Resulting in a longer service life with less downtime and equipment replacements due to weld failure. The inspiration comes from the flagship brand, SafeRack and it’s industry-leading safe access gangways and our innovative patented technology and modular access systems. With these patents and expertise in vehicle loading, MarinaStep is built from sturdy marine grade aluminum, galvanized or stainless steel and offers both standard as well as customized solutions to fit specific customer needs. The vessel gangways are available in sizes up to 50’ in length and 5’ in width. Special-purpose gangways exceeding those measurements can also be built. 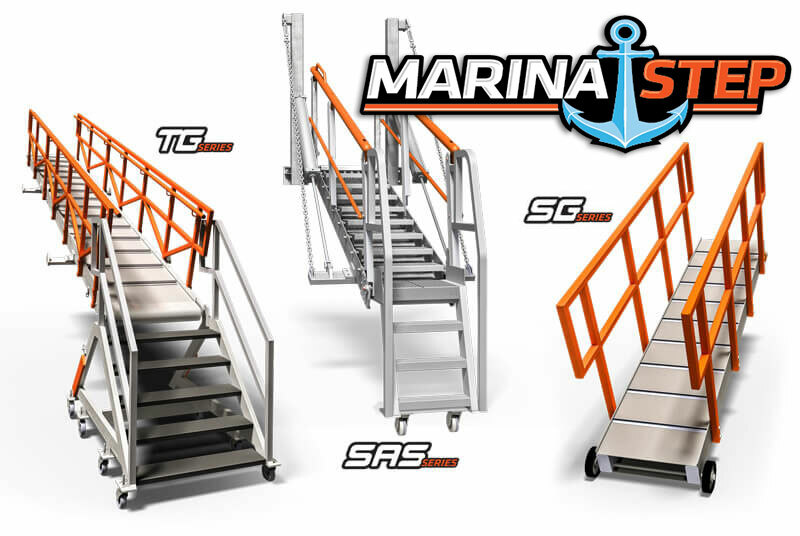 MarinaStep offers three specific gangway styles to assure marine users safe access solutions to fit their different, unique sites and operating conditions: the Self-Adjusting Stair, Stage Series and Truss Series. MarinaStep’s self-adjusting stairs are built to the highest quality and allow for operating in aggressive angles to provide safe access from ship to shore. 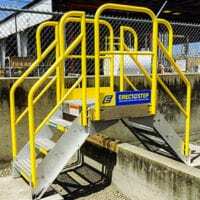 This style is a perfect solution to reach both short and intermediate distances, providing a slip-resistance and level step for users along the entire length of the gangway. The Stage and Truss Series use a rugged U-body construction to provide a live load capacity of 750 pounds and can be constructed to accommodate even higher load capacities. The Stage Series allows for up to 20 feet in length, and the more robust Truss Series allows for up to 50 feet in length. Both have multiple walk surfaces available to allow for better footing or to give the necessary traction required for the operating angles. Customers can choose between a stamped aggressive tread, diamond plated walk surface with or without cleats depending on the necessary angles, or an extruded curved tread design that allows for up to 45 degrees of operation. MarinaStep is quickly becoming the leader in Marine vessel safe access. SafeRack is a SixAxis LLC company based in Andrews, SC. Founded in 2003, the company manufactures industrial safety products and provides design and construction services that improve worker safety and productivity in truck, railcar, marine and other industrial loading applications. SafeRack gangways and loading platforms are engineered and configured to comply with safety regulations, delivering a fall protection system that’s easy to operate and requires little maintenance. Many of the world’s leading rail and truck carriers of crude oil, aggregates, liquid natural gas and other bulk products trust SafeRack for their unparalleled service, speed of delivery and quality product.